We are an organization of volunteers offering a second chance to rabbits who would otherwise be euthanized or neglected in a cage or hutch. The special homes providing foster care for bunnies waiting for adoption must be carefully screened to ensure they offer the best home care possible. Fostering a rescued rabbit is a big responsibility. You must be able to provide a safe, clean and caring environment for an animal that will require time for rest and healing. Medical care will be provided by CCRR. 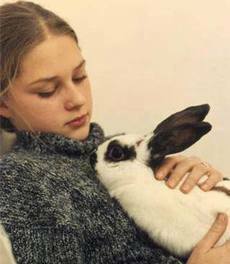 When rabbits are first rescued, they are generally scared and shy. Sometimes we don't know what their past lives have been like. Many of the rabbits that come to us have been severely neglected. Others have been abused or left to live in tiny, wire cages with insufficient food and absolutely no love. Many of these rabbits have been strays or abandoned. Their spirits are broken. Their confidence and trust shattered. When they come to you they may be scared and confused. Please be patient with our rabbits. They will settle in after a few days of quiet rest. Handle them gently and lovingly. We have never met a rabbit that doesn't love head pats. Most rabbits do not like being held, but they are affectionate little animals when given the chance. Handle them as often as you can. The more they are socialized, the better chance they have of being adopted. It is not possible for us to predict how long a rabbit will be in foster care before its permanent home is found, though we do ask for a one month commitment. Some rabbits are in foster care for as short as a few days to up to several months. How quickly we can place a rabbit depends on many factors, such as physical appeal, age, health and training. For many rabbits we've found that foster families who provide basic socializing (handling and interaction) make them easier to place. If you, as the foster family, decide to adopt your foster rabbit we ask you to let us know in a timely manner so that we can be respectful to any potential adopters. We give foster families first refusal to adopt. CCRR, expects all fostered rabbits to live inside the home. We will provide foster families with a borrowed cage and starter supplies to be returned upon foster termination. It is also mandatory that foster rabbits be in their pens while alone in the home and only let out under supervision. Do not ever leave your bunny alone with other pets! Families must be able to provide their rabbits with daily exercise. A bathroom or laundry room works great for this. Make sure you supervise and take precautions with wires. Rabbits like to chew! They can't help it. It's instinctive. ​ Rabbits are prey animals and need to feel secure. We are House Rabbit Society advocates and believe that rabbits should be kept as other companion animals. They do not need to be caged or kept alone in hutches. Rabbits are very clean and quick to learn good litter box habits. We recommend buying a cheap dish pan and putting wood pellets down and topping with hay. This encourages bunny to use it. CCRR likes foster families to use ex-pens (with secure covers if you have other animals) or create your own fenced off area. Not only is it better for your rabbit, but easier for you! A quick, daily sweep is all that is needed to keep your rabbit comfortable and sanitary. Litter boxes (use wood pellets with hay on top. This encourages use.) will require cleaning 2x/week. Ask us for more information! We've got tips! Your foster rabbit will need to be fed 1/4 cup of plain pellets and good hay (timothy hay) daily as well as plenty of fresh water (sturdy crocks work best.) While we give foster families a bunny starter kit, we do require them to purchase pellets (of our approval) and hay from then on after. CCRR will contact you to set-up times for potential adoptee visits. We expect foster families to be flexible when it comes to meet + greets. Remember, our first objective is to find these rabbits forever, loving homes. If you know of a good match for your foster rabbit, please ask them to fill out an Adoption Application. CCRR expects to be notified if the foster rabbit is ill or appears to be unwell. CCRR provides all medical treatment for our rabbits. DO NOT TAKE YOUR FOSTER RABBIT TO THE VET UNLESS YOU CONTACT US. THIS IS FOR ANY CIRCUMSTANCE. VETTING DONE WITHOUT THE PERMISSION OF CCRR WILL RESULT IN YOU PAYING THE BILL. NO EXCEPTIONS. IF YOUR FOSTER RABBIT NEEDS VETTING CONTACT US ASAP. Foster families must also be willing to transport bunny to scheduled spay/neuter appointments and must live within a 35 mile radius of Cottontail Cottage. ​ We make every effort to find a good foster match but please remember we cannot be held responsible for any damage to either person or property caused by the foster rabbit. We will NOT be responsible for any medical expenses from injuries caused by the foster rabbit to your own personal pets or pets that are visiting. Foster Families are VERY SPECIAL to us at CCRR. It takes a kind, loving and compassionate person to provide a temporary home for one of our rabbits. Thank you for thinking of home care and helping us on our mission to save somebunny today. We couldn't do it without you! And our bunnies NEED YOU! !